The American Institute of Mathematics has a great program for what they call focused collaborative research: SQuaREs, which stands for “Structured Quartet Research Ensembles”. A small group, between 4 and 6 members, applies with a particular research project. The groups that are supported spend a week at AIM working on the project, with the possibility of returning. 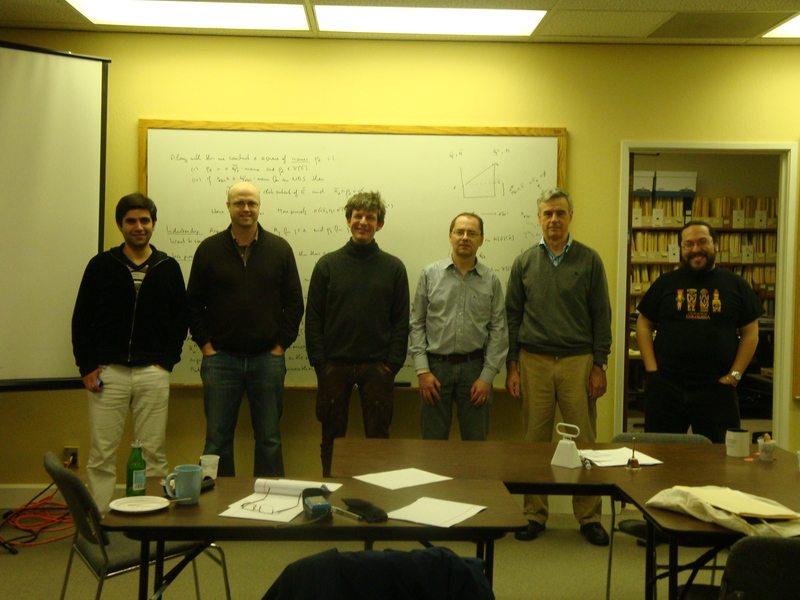 I am part of a 6 people SQuaRE group, working on “Descriptive aspects of Inner model theory”. The first meeting took place on May 16-20, 2011, you can see a picture here. This year we met for a follow-up, on April 16-20. These meetings are fantastic, I think. Of course, they are exhausting and quite intense, but they pay off handsomely. I expect I’ll be posting soon on some of our results. This entry was posted on Friday, April 27th, 2012 at 2:33 pm and is filed under Conferences. You can follow any responses to this entry through the RSS 2.0 feed. You can leave a response, or trackback from your own site.